A new generation Korean face mask combines skincare with gemstone therapy, aromatherapy and colour therapy to achieve multi-sensory results. The first of the 4-in-1 therapies is Colour Therapy which helps to align your chakras to different wavelengths depending on which colour the mask contains. 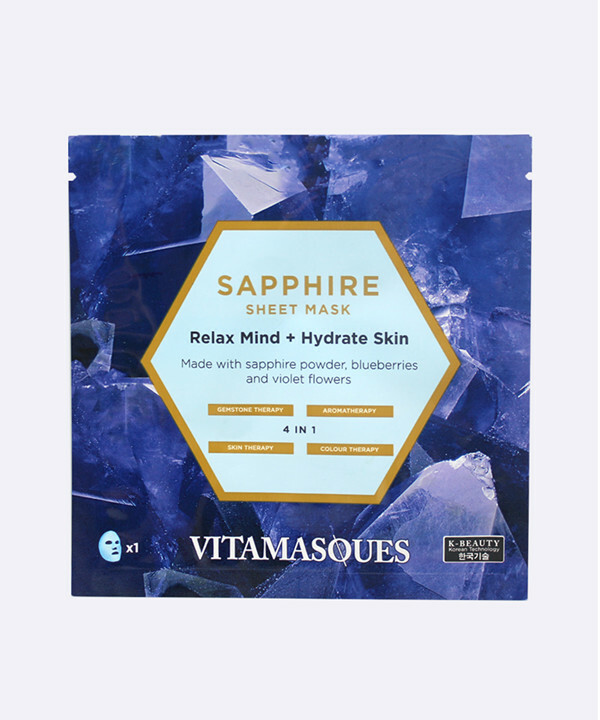 This blue coloured mask contains sapphire powder and lavender essential oil to help you to relax and sleep well. The blue plant extracts, such as blueberries and violet flowers help to hydrate and clarify your skin. Sapphire, the stone of wisdom is a powerful gemstone that brings order, strength and focus. This collection is the perfect self-pamper, all in one mind and body treatment for balancing and treating your skin The Gemstone collection is also completely Free of Mineral Oil, Phthalates & Sulphates, Animal Cruelty and Vegan-Friendly. Why use Vitamasques? Inspired by Korean innovation, a triple layer sheet technology designed to enhance the moisture content within the mask and lead to an increased absorption rate within the skin. Try adding VITAMASQUES to your skin care regimen and leave a review to let us know what you think! Made in South Korea.